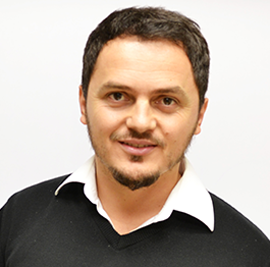 At age 13, Ridvan Aliu began programming with QBasic on Windows 95 and started working with web technologies in 1999. Later, Aliu came to U.S. as an exchange student from Kosovo and graduated from an Oregon high school at the age of 16. He earned a Bachelors degree in Multimedia Design and Masters in Software Engineering. In the last decade, Aliu has served as a senior software engineer for Microsoft, Amazon, Disney and Real Networks. In 2006, Aliu founded software consulting company Real Visualz, LLC. and now leads EDUonGo Inc., a start-up that hosts over 1,000 academies around the world. Additionally, Aliu teaches computer science, mobile technology and web development courses at Bellevue College. Previously, Aliu built the Amazon Instant Video (AIV) client app for the following Panasonic, Samsung, Sonny, LG and Roku. He also helped create the SYNC infotainment system for Ford Automotive, the Freestyle Dispenser for the Coca-Cola company and Comcast Game Community.